The law firm of Beaumont, Smith, and Harris writes that they have enclosed $50 for the work of the Berry Schools on behalf of Mrs. William R. Kales. 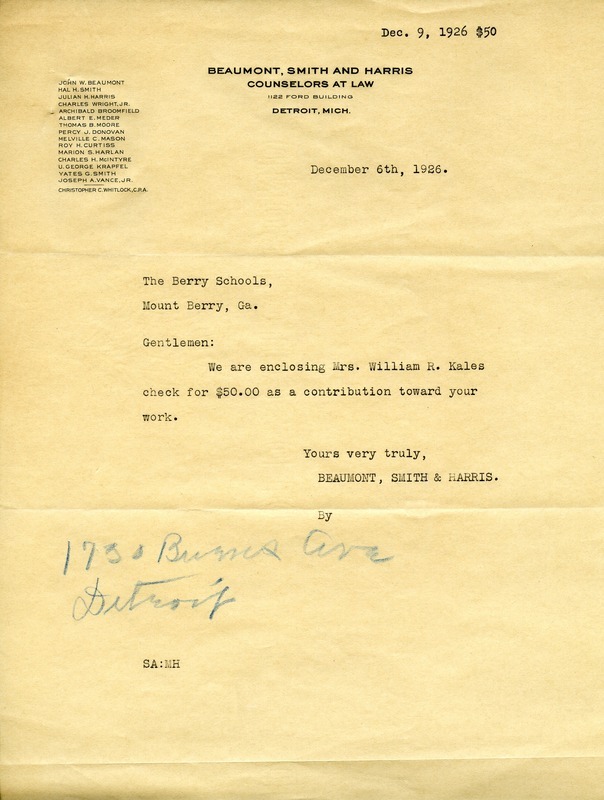 Beaumont, Smith, and Harris Counselors at Law, “Letter to the Berry Schools from Beaumont, Smith, and Harris.” Martha Berry Digital Archive. Eds. Schlitz, Stephanie A., Christy Snider, Ree Palmer, et al. Mount Berry: Berry College, 2012. accessed April 22, 2019, https://mbda.berry.edu/items/show/2178.